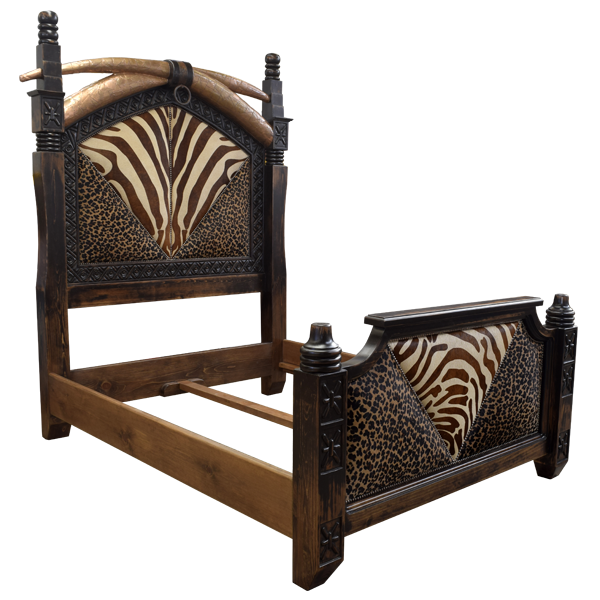 If you are looking for a bed with a creative design that is made with the highest quality material, then this marvelous, handcrafted, safari inspired bed is perfect. The padded front of the arched, curved headboard has a ¨V¨ shaped design covered with two types of simulated, animal print, leather upholstery. 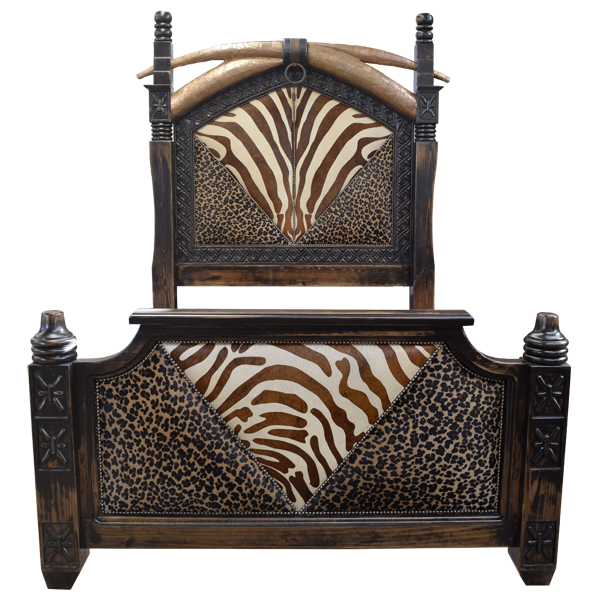 The lower section is upholstered with simulated, leopard print, full grain leather, and the center section is upholstered with simulated, zebra print, full grain leather. All sides of the leather panel are bordered by exquisite, hand carved, geometric shaped designs. 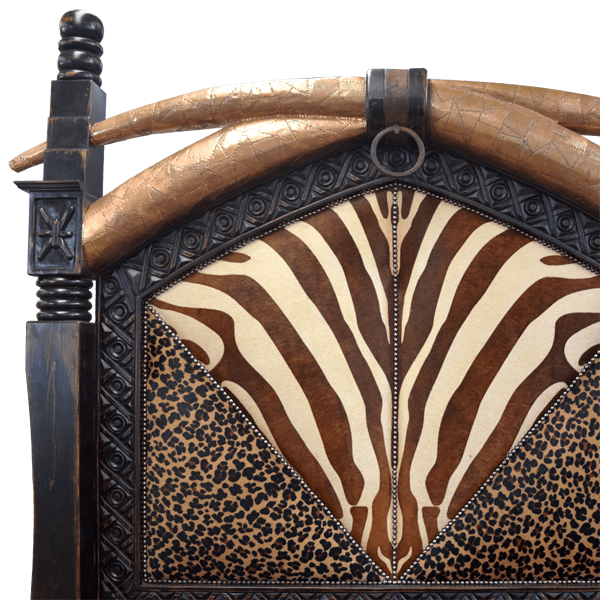 The top of the headboard is embellished with two, crossed, solid wood, stylized, elephant tusks, and each tusk is covered with hand hammered copper in a mosaic design. Centered in the tusk is a dark, hand carved detail, accented with a hand forged, iron ring. The headboard is framed with tall, solid wood, side uprights, and each side upright has hand carved, floral designs on its front, and it is topped with a solid wood sphere. The rectangular footboard has a center, top molding. 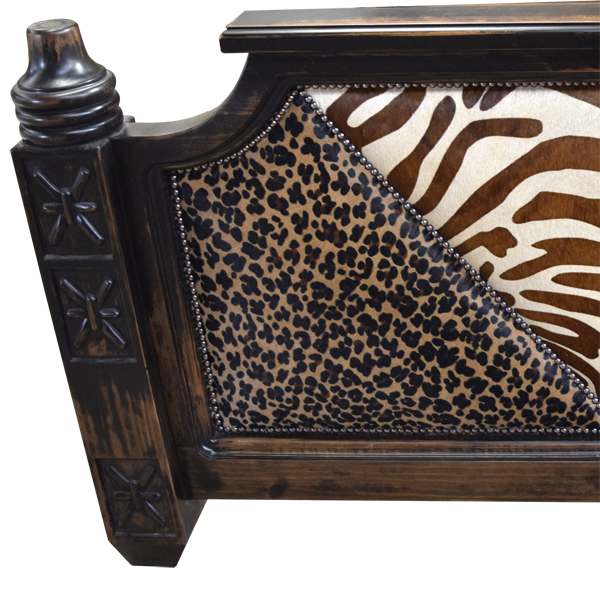 The padded front of the footboard has a ¨V¨ shaped design, and its center section is upholstered with simulated, zebra print, full grain leather. The lower section is covered with simulated, leopard print, full grain leather. All of the leather is double stitched together for extra strength and durability, and the upholstery is hand tacked to the frame with beautiful, gilt nails. 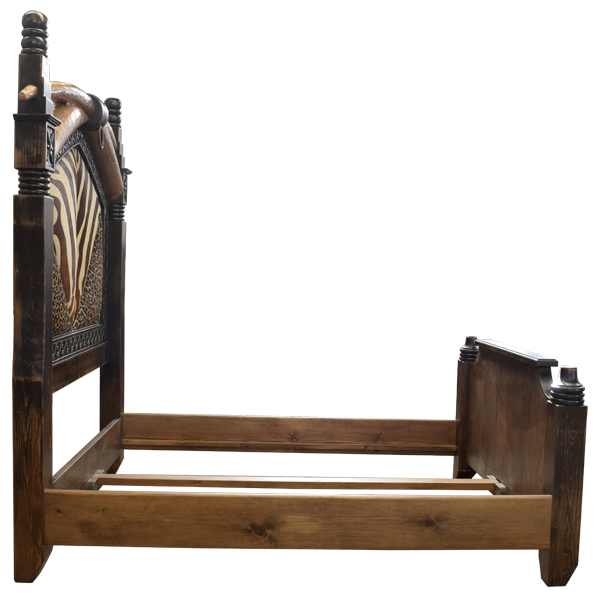 The footboard is framed with solid wood uprights, and each upright is decorated on its front with hand carved, floral designs, and it is topped with a hand turned, robust design. The bed rest on sturdy, square cut legs, and it has solid wood, side rails. It has an antique finish, and it is made with the best, sustainable, solid wood available. The bed is 100% customizable.